Elephant squatter evicted from Ingwelala Camp! 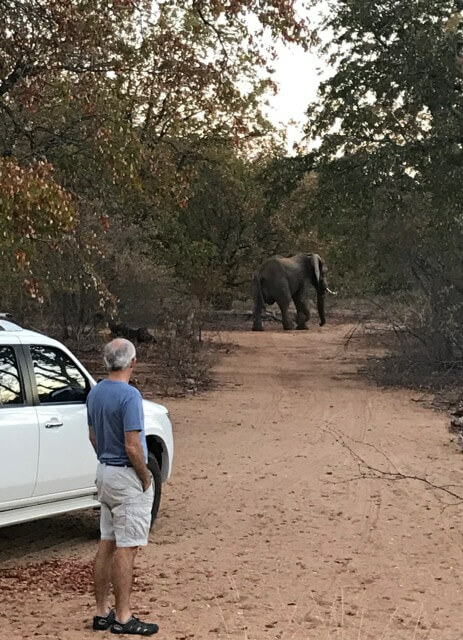 A bull elephant broke through the perimeter fence and moved into the Ingwelala Camp, where he has been for a number of weeks. He is known to Elephants Alive as Draco, with his distinctive tear on his right ear and elongated wart on his left temporal gland. Although peaceful and gentle, he was damaging a number of trees and water pipes in a confined space, and there was concern about his close proximity to households and families. A helicopter had been brought in – twice  - to try and shoo him out, but he refused to budge. So Elephants Alive and the WildlifeVet team were called in to relocate him. It was a swift, smooth and successful operation, with the full support and assistance of Chris Mayes, Ingwelala Conservation Manager and Bryan Haveman, Umbabat Warden. The elephant was darted close to a camp road, thanks to the skillful flying of helicopter pilot Jana Meyer from Wildlife Aviation. The Elephants Alive team and Wildlife Vets quickly moved examined the the sleeping giant. He was gently and carefully hoisted onto a flatbed truck, as the Elephants Alive team took vital samples and measurements. The truck then slowly drove the elephant out of Ingwelala Camp, and Draco was moved 40kms away. The crane carefully lifted him off the flatbed truck and the vets brought him round with ease. Draco stood up within a few minutes and with a shake of his head, moved off into the extended part of the Private Reserves. In the meantime, the fence surrounding Ingwelala Camp has been repaired so we all hope Draco will not return! A very big thank you to Ingwelala and Umbabat for their support, assistance and understanding, and thank you to the WildlifeVets team and WildSkies Aviation.